Read what participants said about last year’s Natural Death Care Symposium. 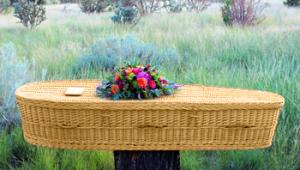 What natural burial is, how it works, its human and ecological benefits. Why natural burial is an increasingly popular choice in the Pacific Northwest. How natural burial lends itself to crafting relevant and meaningful end of life rituals. What you need to know to plan for a natural burial. The unique urban and rural options provided by two Green Burial Council-certified non-profit cemeteries in the region: historic River View Cemetery in the heart of Portland and White Eagle Memorial Preserve in the Columbia River Gorge. Connect with others who want their death to reflect the environmental values they’ve practiced in life. Tour beautiful, historic River View Cemetery (optional) following the April 22 workshop. Play a surprisingly fun, deeply meaningful, thought-provoking, fear-conquering conversation game about living and dying well. Leave with a booklet of questions to share with family and friends, and a personal Next Steps Guide to inform your decisions about healthcare proxy, advance directive, caregiver support, and memorialization. In partnership with National Health Care Decisions Day. Tour the region’s leading conservation burial ground in Goldendale, WA. Participate in a ritual of remembrance. Carpools can be arranged from Hood River (1.5 hr drive) or Portland (2.5 hr drive). Please follow the directions on the website to reach White Eagle, as GPS and phone map apps may take you the wrong way. Presented as a community service by the non-profit burial grounds River View Cemetery & White Eagle Memorial Preserve in partnership with Holly Pruett, Life-Cycle Celebrant and Home Funeral Guide & the Death Talk Project, with support from Passages International and the Hood River Library. David Noble, Executive Director of River View Cemetery ~ David Noble has been serving Oregon families for 44 years as a funeral director, embalmer, cemetery owner, and currently, as Executive Director of River View Cemetery in Portland. Five years ago, River View began offering the option of burial without embalming, without an outer burial container, or even without a casket, throughout the entire cemetery. Natural burial now constitutes over 25% of River View’s burials. David is an avid supporter of green burials, as well as home funerals, and has made presentations on the merits of green burial at numerous national and local conventions of funeral directors and cemetery owners/operators. Holly Pruett, Life-Cycle Celebrant & Home Funeral Guide ~ A Life-Cycle Celebrant and Home Funeral Guide, Holly works with individuals, families, and communities to create unique, personalized ceremonies from cradle to grave. As a community conversation leader, Holly is the founder of the Death Talk Project, has organized PDX Death Café (the largest in the world) since 2013, and was the driving force behind the 500-person conference Death:OK (Let’s Talk About It).